On 28th January, the UK ITF held its annual National Training Day and Awards Evening. Looking to be our most supported and successful to date, with 130 members training and over 200 attending the evening black tie event, we were all eager to get the day underway. To kick start the training, Master Nicholls, along with support from Master Horan, Master Gassor and Master Rauli led an ‘instructors’ training session. Dedicated to our Senior and International Instructors this was a great opportunity for members to step outside their teaching remit, kicking, punching and find enjoyment in training together as students of Taekwon-Do. Covering traditional line-work, patterns Chon Ji-Tong Il and striking techniques on the pads, all students left tired yet invigorated and positive in their training, teaching and the support offered from Grand Master Nicholls and the UK ITF. After a short break, it was time for the training day to commence. With the room flooded with member’s blue belt and above, it was a great opportunity to meet old friends and spark new friendships forged through a mutual love for the art. Following a warm welcome and introduction from Grand Master Nicholls, we were ready to begin. Looking in-depth at striking and blocking techniques, Master Nicholls encouraged members to enjoy the movements and engage the body’s natural hip twist along with an effective reaction hand to exert the maximum amount of force possible. To complete the morning session, students were offered the chance to take part in group workshops led by Master Horan, Master Gassor and Master Rauli. 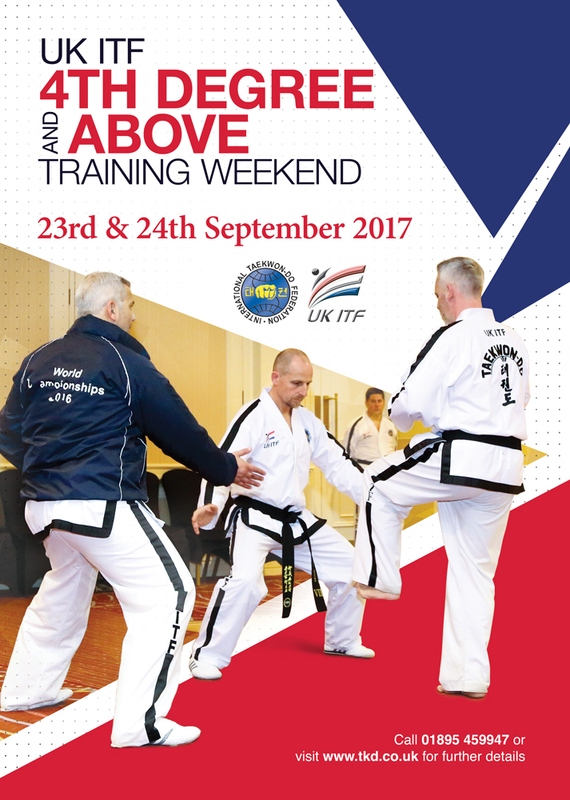 Covering Leg strength, stretching, self-defence drills and Taekwon-Do’s training secrets, this was a great opportunity to learn different training methods from the Masters and gain knowledge from their wisdom. Following a short water break, students were instructed to ‘pad up’ and prepare for sparring drills. Led by Mr Buxton, Mr Brunger, Mr Nicholls and Mr McAvoy the afternoon session entailed a series of punch combination, counterattack kicking and effective sparring drills. Bouncing ideas of one another, the 4 world champions of past and present offered the students a variety of sparring drills which we are sure will benefit those competing in the upcoming National Championships. Before calling the day to a close, Master Nicholls finished the session by explaining the importance that the UK ITF is greater than just one person and that we must all work together, learn from one another and enjoy in our training together. After respects paid and photos taken it was time to relax and prepare for the evening festivities. Champagne, Live music and good friends. The awards evening was set to once again be a great celebration and reflection of the successes of 2016……And we had a great deal to celebrate! After a lovely three course meal Master Nicholls took to the stage to express his gratitude and thanks to all those that have helped to make 2016 such a successful year. With hosting the ITF World Championships, 2 National Championships, Finals Day and countless seminars and Regional events run throughout the UK, 2016 was certainly a very busy and positive year. On to the National Awards 2016……. Along with National awards, Regional presentations were made to highlight and congratulate hard working and dedicated students within the Region. Echoing the words of Master Nicholls throughout the training day, it is only with the support of ALL its members that the UK ITF has been able to flourish and expand as a professionally run and credible organisation, and to celebrate these members is a true privilege. This was also a great opportunity to highlight and congratulate our World Champions as well as those who went beyond the call of duty to help make the event the true spectacle it was. This included presentations to Simon Oakes and Geoff Silva for their generous sponsorship toward the event, as well as Mac Attram, Umbreen Khan and Gav Sidhu for all their efforts on the build up to/ and throughout the event. To end the awards ceremony, students were presented with their 10/20-year service awards. This was perhaps a fitting end to the day as this year marks the 50th Anniversary of Taekwon-Do in the UK. Congratulations must also extend to Mr Mac Attram for his successful promotion to 5th Degree black belt which was officially announced at the awards evening as well as Master Hogan for receiving his official promotion certificate and belt to 8th Degree Master.